- Cookie Dough Majestic Shake - A Cookie Dough shake served in a glass jar rimmed with vanilla frosting and chocolate sprinkles. It comes topped with a "mountain" of vanilla frosting, brownies, Oreos, cookie dough pieces, chocolate pirouette, and a Hershey's chocolate drizzle. 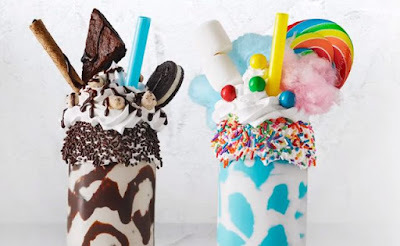 - Cotton Candy Majestic Shake - A Blue Cotton Candy shake served in a glass jar rimmed with vanilla frosting and rainbow sprinkles. The shake is then piled high with vanilla frosting, a rainbow swirl lollipop, marshmallows, cotton candy, and mini gumballs. Both Majestic Shakes retail for $9.99. They plan to release more Majestic Shake flavors throughout the year. Photo via Marble Slab Creamery and MaggieMoo's Ice Cream and Treatery.